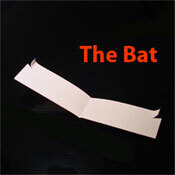 The Bat imitates modern day gliders, it is capable of traveling very long distances, but works best when there are existing air currents that it can use to fly on. This paper airplane is the most fun outdoors where a gust of wind can carry it very high and far. 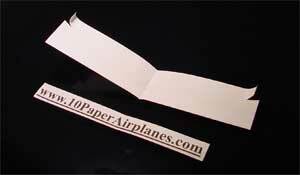 To make this paper airplane you will need a single sheet of paper and a pair of scissors. 1. Fold the paper into thirds and then unfold it so that there are creases left, then either cut or tear along the creases to make three strips of paper. You will only need one strip per plane. 2. Beginning on one of the long sides, fold it down evenly about 1/2 inch. Repeat this step for a total of 4 folds. Keep your folds as tight and even as possible. 3. 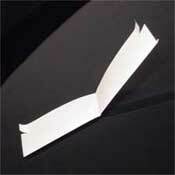 Flip the paper airplane over to its other side and fold it in half evenly. 4. 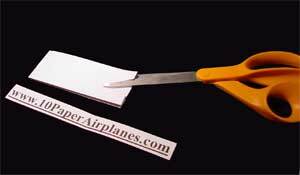 Using your scissors, make a small (about 1/4 to 1/2 inch long) cut into the rear of the wings to make small 'winglets' as shown in the pictures. You will use these to fine-tune the Bat's tendancy to turn during flight. Your Bat may need some fine-tuning before it will fly perfectly straight. If it dives, slightly angle the back-edge of the wings up. If it climbs and crashes, slightly angle the back-edge of the wings down. To throw the Bat , hold your hand like you would if you were mimicking a pair of scissors with your first and second fingers extended one over the other. Hold the Bat along the centerline between the 'blades' of the scissors and push it forward through the air.